Burnley’s pre-season continued with a fourth win in five, this time a comprehensive 3-1 win over Rangers at Ibrox with Andre Gray netting a hat trick to take his total of pre-season goals to eight in five games. Pre-season is all about the players building up their fitness and preparing for a new season, but it certainly does no harm at all when your leading goalscorer is finding the net and Gray has done that with some regularity in this pre-season; he’s netted in all five games, including a brace at Bradford and the three in this game. In truth, it really was a comfortable win for the Clarets, more comfortable than the scoreline suggests against a side that, in all probability, would struggle in our Championship. 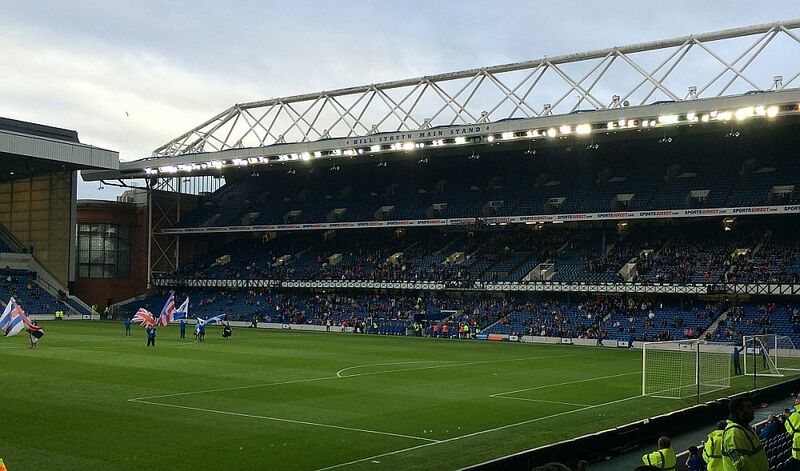 I like seeing Burnley play different teams, so a trip back to Ibrox within a year of the last visit probably wasn’t high on my list of potential pre-season games, but this is one of those grounds that you wouldn’t really want to pass up the opportunity of seeing the Clarets there. I wrote last year, after the game which saw Scott Arfield give us a 1-0 win, that I’d now like to see us play a friendly at the San Siro or maybe Santiago Bernebéu, but it was Ibrox again. It was a late decision to go after back problems had kept me away from Bolton but I opted to make use of the train tickets I’d bought some time ago and was in Glasgow for 12 noon. After a short time exploring the city, it was off to Ibrox. With no Subway available, it meant catching a bus or for those more able bodied just over two miles on Shanks’s pony, and after the obligatory walk around this iconic stadium, seeing the John Greig statue and the facade of the old main stand, it was through the turnstiles and into my seat (on this occasion, standing position) ready for the game. Whatever you make of the place, from the minute Tina Turner blasts out The Best, alongside the singing of Penny Arcade, there is a terrific atmosphere in the place, a reminder of the Jimmy Mullen days at Turf Moor. We were to find out in the next ninety minutes that Rangers are not the best, far from it. The Burnley team was almost as you would expect it other than the two full back positions. Again Tendayi Darikwa was preferred to Matt Lowton on the right while Danny Lafferty deputised for the injured Stephen Ward. Up front, there was a return to Burnley action for Euro semi-finalist Sam Vokes alongside Gray, while our strongest midfield selection from last season was all on duty, even if one of them was in the light blue of the home side leaving Dean Marney and David Jones to play for the Clarets. The one in the light blue was of course Joey Barton. He played strangely at the base of a diamond, hardly moved forward, other than to take a free kick, and was hardly recognisable of the influential midfielder who played such a part in our promotion. I can imagine him soon getting frustrated in that role in that team. A year ago it took us 35 minutes to go in front in a game when Rangers, up to that point, had been the better of the two sides. This time it took us less than four minutes to go in front and from that moment on there was only ever going to be one winner. Gray got on the end of a ball from Dean Marney and was fouled by Clint Hill. ‘Gers boss Mark Warburton, in post-match excuse mode, said he couldn’t see how it could be given, but there was no real complaint from the defenders and Gray stepped up to score past goalkeeper Wes Foderingham. This seems an appropriate time to comment on Marney. I was always of the belief that he was a sorely missed player once he’d suffered his cruciate ligament, and remember when he did it we were 2-0 at home against West Brom who went on to take a point. Rangers were offering little. They did have one effort that flew wide but no one could deny we deserved to double our lead, and when we did it was the goal of the game. Again Gray got onto a ball, this time from Arfield, and hit a terrific curling shot into the corner. Although to his near post, Foderingham didn’t have an earthly chance of getting to it. What an outstanding goal from Gray. We were so much on top and had chances to increase the lead way beyond the two goals we did get. Vokes had opportunities and saw one effort come back off the foot of the post. It ended a superb move involving Marney and Gray who played it to Vokes who was so, so unlucky to see his effort hit the woodwork. As poor as Rangers were, there was much to be admired from the way we were playing. In a Burnley dominated half, Rangers did win a free kick a few yards outside our box. As Barton, who had previously fired a shot straight at Tom Heaton, stepped up, it did afford him a warm reception from the Burnley fans although, other than in a friendly, I’m not sure I’d have appreciated such a response as he was lining up to try and beat Heaton with a set piece. Both sides made changes at half time, but only three in total. Matt Gilks joined Barton to double the number of ex-Clarets on the pitch while we introduced both Lukas Jutkiewicz and debutant Johann Berg Gudmundsson for Vokes and Arfield. Gilks’ first contribution was to pick the ball out of his net after Gray had made it 3-0 and wheeled away to celebrate his hat trick. It was another very good goal. Gray received the ball from an excellent head down from Juke and steadied himself before wrong footing Gilks. We probably should have gone on and won this game by more goals but we did relax somewhat. Rangers pulled one back via a Ben Mee own goal and might have even reduced the advantage even more which really would have given the game a false scoreline. Sean Dyche was clearly unhappy with how it went in that last half hour. There was no need for it and we should have gone on and won the game far more convincingly in terms of the score than we did. I mentioned Jimmy Mullen earlier in the report, given the entrance music, and it was all Mullen like for the Rangers players at the end when they were locked in the dressing room for quite some time for discussions with the manager. Overall, I was so, so pleased with the way we played yesterday. There were far more positives than negatives, but we certainly will come up against nineteen teams in the league this season who are considerably better teams than Rangers, of that there is no doubt. So there is absolutely no need to get carried away with this win. We are all but on the final straight towards that season now, just thirteen days and one friendly away from the big kick off. I’m expecting there to be more players in the squad by then, maybe some even this week before Real Sociedad arrive. Like most Burnley fans, I’ve been very frustrated by our transfer activity, or rather lack of it. Overall, a really good day and I don’t think I was the only Burnley fan to travel by train. When I finally got arrived at Burnley Manchester Road, I don’t think the station has ever seen so many people arriving at one time. I’m looking forward to Friday now – our new monster floodlights, a new club shop, but more importantly a Premier League Burnley team back in action at Turf Moor. Rangers: Wes Foderingham (Matt Gilks ht), James Tavernier, Rob Kiernan, Clint Hill (Danny Wilson 63), Lee Wallace (Lee Hodson 63), Andy Halliday, Niko Kranjcar (Harry Forrester 63), Joey Barton (Jordan Rossiter 63), Barrie McKay, Kenny Miller (Joe Dodoo 63), Martyn Waghorn (Michael O’Halloran 63). Burnley: Tom Heaton, Tendayi Darikwa, Michael Keane, Ben Mee, Danny Lafferty, Scott Arfield (Johann Berg Gudmundsson ht), Dean Marney (Michael Kightly 84), David Jones (Aiden O’Neill 84), George Boyd (Fredrik Ulvestad 84), Sam Vokes (Lukas Jutkiewicz ht), Andre Gray (Chris Long 84). Subs not used: Paul Robinson, Matt Lowton, James Tarkowski, Conor Mitchell.